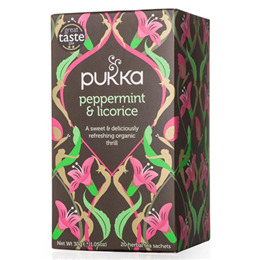 Pukka Teas Peppermint & Licorice contains the natural joy of FairWild licorice root, the minty brilliance of fresh peppermint leaves - it’s nature’s perfect blend, carefully concocted to give your senses goose-bumps. Now just enjoy the ride! Peppermint Leaf (60%), Licorice Root (40%). Bring these incredible herbs alive by infusing in freshly boiled water for at least 5 minutes. Contains licorice - people suffering from hypertension should avoid excess consumption. Below are reviews of Pukka Teas Organic Peppermint & Licorice - 20 Teabags by bodykind customers. If you have tried this product we'd love to hear what you think so please leave a review. I love the free Pukka mug, and your quick and efficient service. Will shop with you again. Love this tea and so glad I can get a 4 pack of 20 teabags in each. Don't expect it will be long until I get the next pack! This tea is one of my favourites, far nicer than a lot of peppermint and liquorice teas. I am a fan of Pukka herbals and this one does not let them down.